Solar panels shine on the rooftop terraces of 10 neat buildings with perfectly straight lines and of uniform height, an image of modernity that contrasts with the precariously-built dwellings with unplastered concrete block walls just a few metres away, with rooms added in a disorderly manner, surrounded by a tangle of electric cables. Villa 31, the most famous shantytown in the capital of Argentina, due to its location in a central area of Buenos Aires, is undergoing a transformation process, not without controversy, in which clean energies play an important role. For decades, Buenos Aires city government authorities periodically promised to eradicate Villa 31, which first emerged nearly 90 years ago, and today is a postcard of poverty, which at the same time shows the vitality of thousands of people who carry out commercial and productive activities despite their deprivation anddependence on the informal economy. But the threats turned into hope in 2009, when a local law was passed that ordered the urbanisation of the Villa, paving streets, giving property titles to the local residents and – in short – turning it into just another neighborhood of a city that historically saw it as a foreign body impossible to hide. In Argentina, the word for slums and shantytowns is villa. A survey released by the government in 2018 indicates that around the country there are 4,228 villas, home to around 3.5 million people, out of a total population of 44 million. In particular, in Buenos Aires proper there are 233,000 people – or 7.6 per cent of the population, not counting the working-class suburbs – living in shantytowns. The urbanisation of Villa 31 is a monumental task that only began to be carried out in 2016 and today is slowly changing the face of a veritable city within a city, which has grown enormously in size in recent years. According to the latest official data, 43,190 people live there, in 10,076 houses, compared to just 12,204 people livingthere when the severe economic crisis broke out in 2001. Since then, despite the fact that Argentina experienced several years of economic growth, Villa 31 was the only option found by more and more families who couldn’t afford to buy or rent a house in the formal market. Villa 31 covers 44 hectares between Retiro, one of the capital’s main railway stations, and La Recoleta, one of the most sought-after neighborhoods in Buenos Aires. 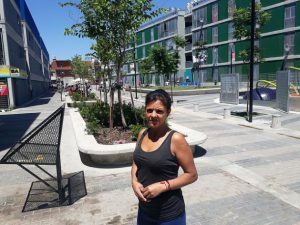 “We came to Villa 31 four years ago, after the building where we lived in the neighborhood of La Boca burned down and we ended up on the street,” Valeria Barrientos, a married mother of four children between the ages of two and 13, told IPS. Barrientos, whose husband is a truck driver, says it is “a gift from heaven” to have hot water and electricity provided by solar energy, even when there are power outages – especially frequent in Villa 31, where the supply is unstable, and where many homes have irregular, precarious connections to the grid. Her family has been living in the La Containera section of the Villa since September 2017, which takes its name from the fact that it was a depot for old containers until three years ago. They were offered an apartment there, to be paid over 30 years, because they lived on a plot of land in the Villa where a highway is now being built. 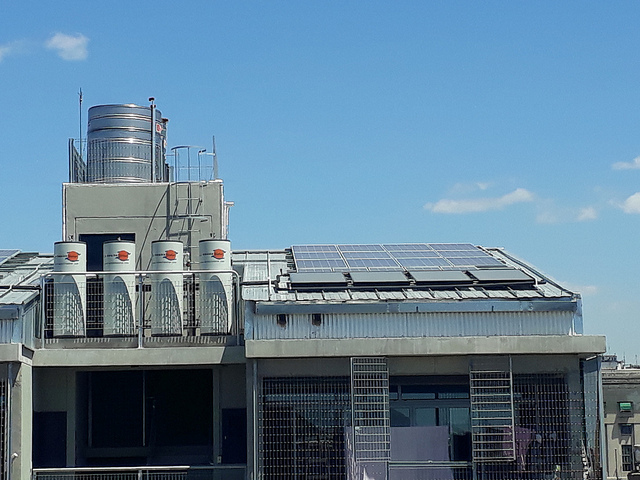 La Containera has three-storey buildings with solar panels to power the thermotanks that heat water for bathrooms and kitchens, to fuel the pumps that raise the water to the tanks, and to provide the homes with electricity. 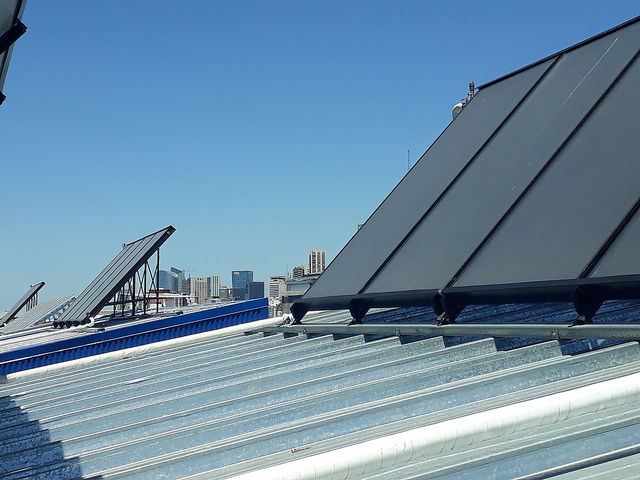 “We installed 174 solar panels on the rooftops in La Containera,” Rodrigo Alonso, general manager of Sustentator, an Argentine company with 10 years of experience in renewable energy, told IPS. “The change today is huge, because the new houses have a guaranteed power supply and do not have to pay for the energy. In addition, the surplus electricity can be injected into the grid,” he added. Arrangements to feed the energy generated by the solar panels into the power grid and to obtain a credit from the distribution company are expected to be formalised in Argentina this year, when the Distributed Generation of Renewable Energies Law, approved in 2017 and whose regulations were completed last November, comes into effect. The solar panels are part of the building and are not individual. Therefore, if in the future there is surplus energy to add to the grid, it will be compensated with a credit for the consortium managing the buildings, which will be subtracted from the charge for energy consumption in the common areas of the housing complex. Solar panels are also being installed to guarantee energy in the most ambitious project going ahead in Villa 31: the construction of 26 buildings with more than 1,000 homes, on land that belonged to the state-owned oil company Yacimientos Petrolíferos Fiscales (YPF). These new homes are earmarked for the people whose houses will be demolished for the construction of the highway and other roads, although many local residents are skeptical. “We are concerned that the promises will not be kept and that many families will end up in the street. We are going to defend each family’s relocation,” Héctor Guanco, who has lived with his family in Villa 31 for nearly 20 years, told IPS. The availability of solar energy makes a decisive difference in a country where electricity tariffs have risen by more than 500 percent in the last three years. 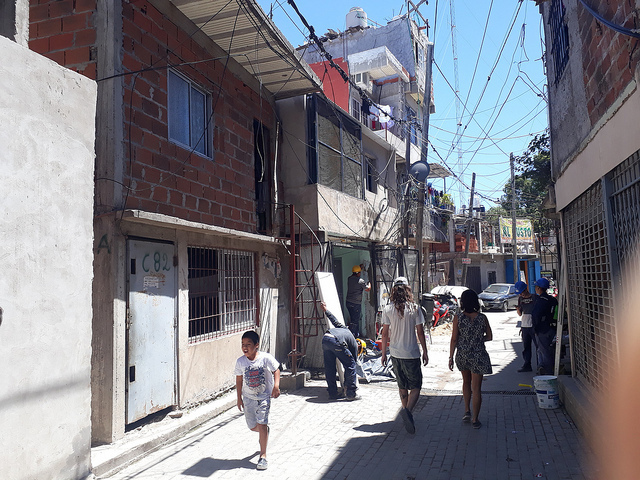 “Going from informality to formality can mean economic pressure that is very difficult to bear, because you have to pay a mortgage for housing, plus taxes and the public services,” Facundo Di Filippo, a former Buenos Aires city councilor, told IPS. Di Filippo was the author of the law for the urbanisation of Villa 31 and is now president of the non-governmental Center for Studies and Action for Equality. The new buildings were built with sustainability criteria that are unprecedented in Buenos Aires, as demanded by the World Bank, which provided a credit of 170 million dollars to finance the urbanisation process. “The walls have both thermal and sound insulation, which reduces energy consumption. In addition, a rainwater collection system was placed on the roofs to irrigate the housing complex’s green spaces,” Juan Ignacio Salari, undersecretary of urban infrastructure for the government of Buenos Aires, told IPS. “We are also trying to move forward with the World Bank to finance a programme to replace household appliances, because many Villa 31 residents have very old refrigerators or air conditioners, which are very energy inefficient,” he added. “The people of Villa 31 want to regularise their situation and pay for the services they receive. The state must help them do this,” said the official, who added that the plan is to put solar panels on the new buildings and formally connect the other houses to the power grid. © 2019 Egypt Market Gateway. All rights reserved.